I had good intentions of sharing this before it actually happened. 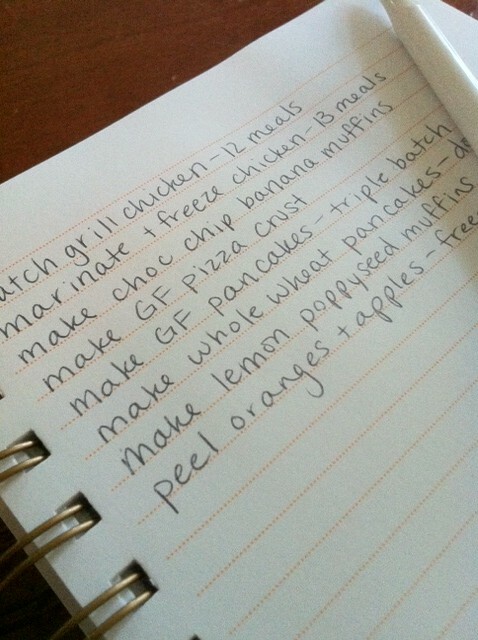 Here we are and I’m mostly finished with this batch cooking list. I had an overly productive weekend, both around the house and in the kitchen. That tends to happen right before I leave town. This week, I’ll spend most of the week and weekend in Colorado Springs at the Savvy Blogging Summit. I had to do quite a bit to get prepared for the week! Also, I received 40 lbs of chicken from Zaycon Foods (you’ll be hearing more about this soon)…and I needed to get it all marinated, some grilled, and into the freezer. It feels great to have accomplished so much in the kitchen over the weekend…squeezed in between washing clothes, packing, scouring the clearance racks at the Gap for a new outfit for the Summit (yeah for 50% off clearance sale! )…and now I’m going to sit down, plop my feet up and rest. How do you freeze the pizza crust? Do you cook it first, or freeze the dough? Yes…that’s how I do it…cook then freeze. I LOVE Zaycon foods! We’ve had their chicken deal twice and just did the bacon deal. If it’s in your area, it is a MUST! Love, love, love. Do you just peel the oranges and freeze them? I’ve never frozen apples either. What’s the consistency end up as? Love the tips! Thanks. I did peel the oranges and freeze them. I only use frozen oranges and apples for smoothies. I really like the flavor that they give! Growing up we had several apple trees and every year my mom froze bags and bags of apples. They aren’t really a good consistency for eating like a fresh apple, but we used them for making homemade applesauce and apple pies all the time. We just peeled them, sliced them for pies and diced them for applesauce and froze 4 cups per freezer bag. (lay flat to freeze they take up less space). To make apple sauce, we just plopped the frozen apples in a saucepan with a tiny bit of water, cover with a lid and cooked on low until tender – stirring often, then add sweetener and spices. Do you know anything about the company? All I’ve heard is how good and cheap the chicken is, but it makes me wonder where it is coming from– does anyone know? I am curious because I would love to order from them, but I am very suspicious when it comes to things like this.